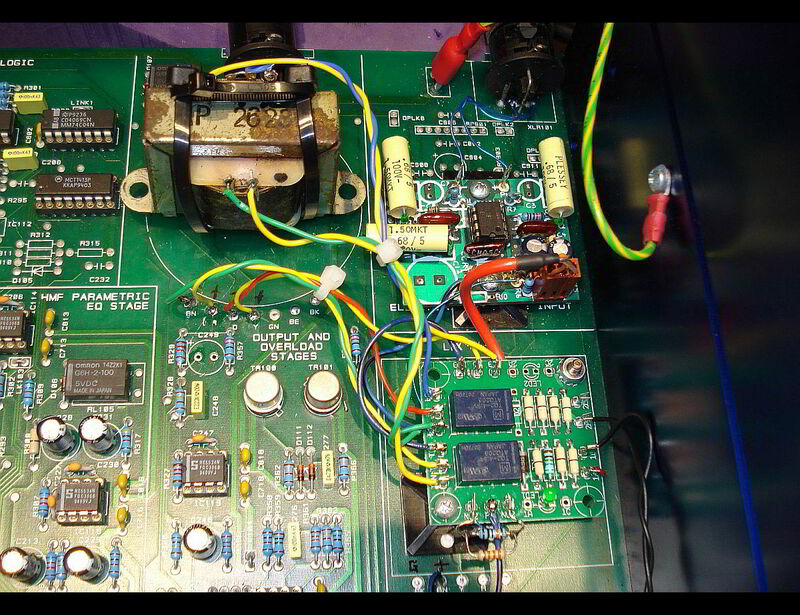 In this closeup, single opamp input stage has replaced stock three opamp input stage. Single opamp employed is OPA-627, chosen for excellent balanced input specs (common mode rejection, etc). The opamp output stage (not showing) is also replaced with OPA-627, chosen for excellent output drive capability. An old transformer from an API console is added to balance the output (there are several good choices for output transformer available on the market today). Hard relay bypass. 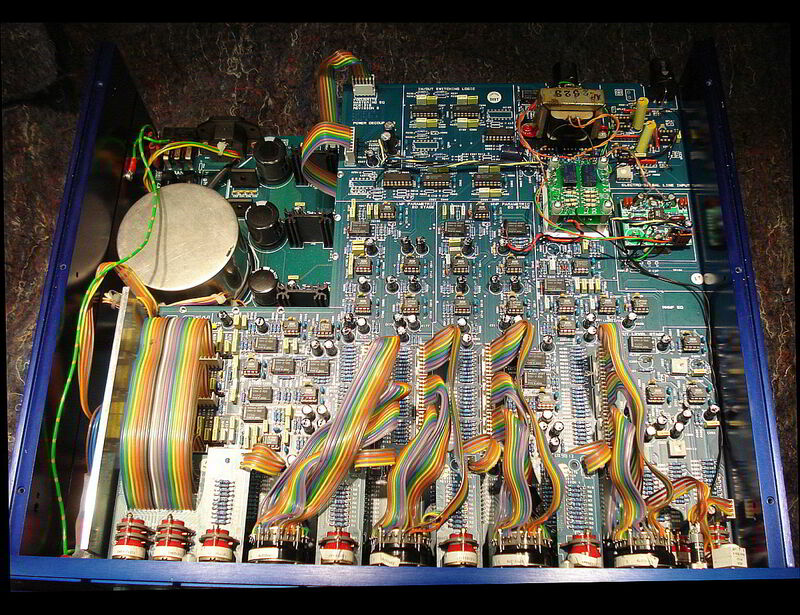 Tied to the original bypass circuitry, true full bypass is accomplished, whereas in the stock unit input and output amps are still engaged during bypass. As one would expect from hard relay bypass, signal still passes through the 315 when power is off. Transformer bypass. On the front panel, the fine gain pot is changed to a pot+push/pull switch. By means of the switch the transformer can be bypassed. With this mod a transformer of warm coloration can be chosen as needed. Circuit values are carefully chosen so there is no gain change when switching transformer in and out. 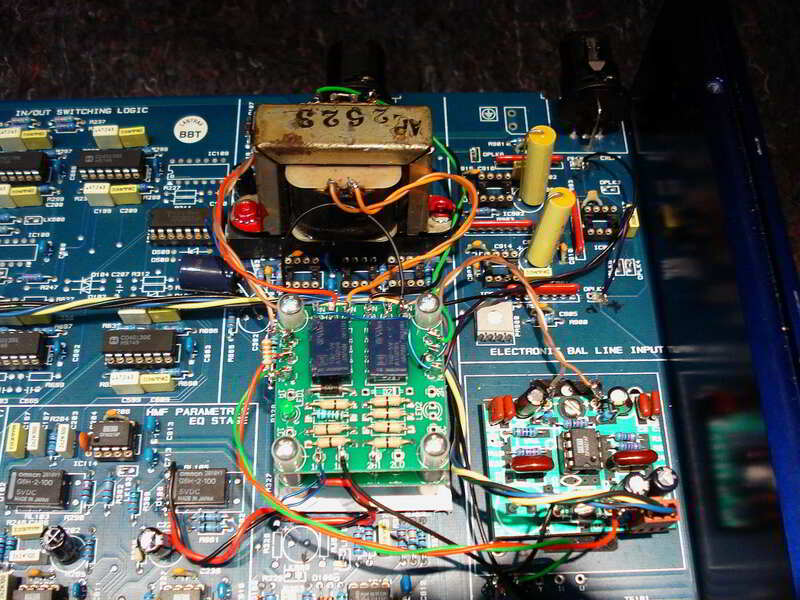 In this closeup, single opamp input stage has replaced stock three opamp input stage. Single opamp employed is OPA-627, chosen for excellent balanced input specs (common mode rejection, etc). This version of the 315 came stock with a toroidal output transformer, and the opamp output plus booster transistor stage is left intact. An old transformer from an API console is added to balance the output and provide warmth (there are several good choices for output transformer available on the market today). This mod is intended to improve the transparency of the Focusrite 315. As the 315 is primarily used by Mastering Engineers it is they who have noticed a lack of transparency not only when the EQ is engaged, but even when it is inserted in the signal chain with EQ bypassed. On transformer balanced models the transformers are not totally transparent. 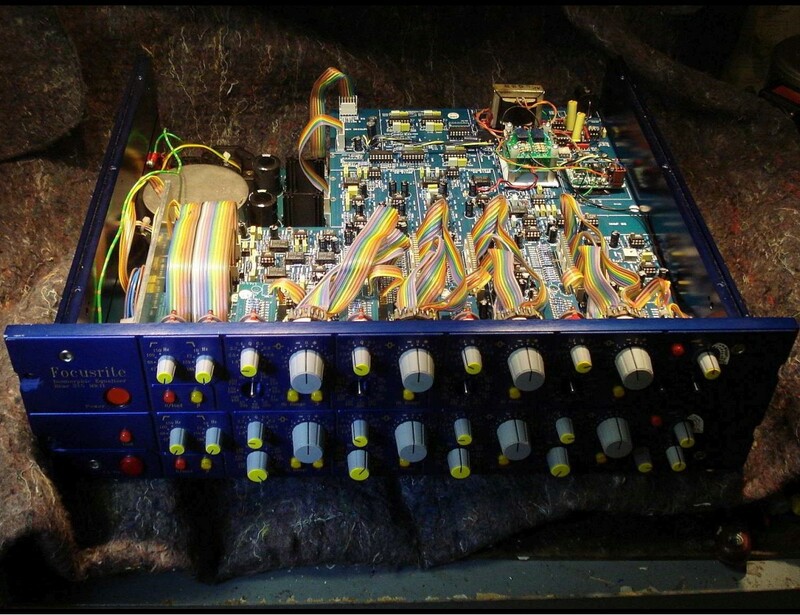 Rarely if ever is a transformer “transparent” to the extent desired by mastering engineers. All audio input and output transformers have their shortcomings, but in some vintage circuitry they add to desirable “character” of the equipment. When no additional “character” is desired transformers are best left out of the design. A rather large number of NE5534 opamps are used in the signal chain. The NE5534 is an excellent audio opamp but falls short of the excellent sonic performance, ie, transparency of discreet opamps or other discreet amps. The vast majority of audio coupling caps are hard bypassed. Bypassing presents no problem for the circuitry* except in a very few instances, the result being small clicks when operating the eq switches. In most of those few instances the glitch is eliminated by replacing the NE5534 with the OPA627 opamp. The OPA627 has virtually zero offset voltage on it’s output and so there is just no dc voltage there to cause a click when it is interupted by a switch. 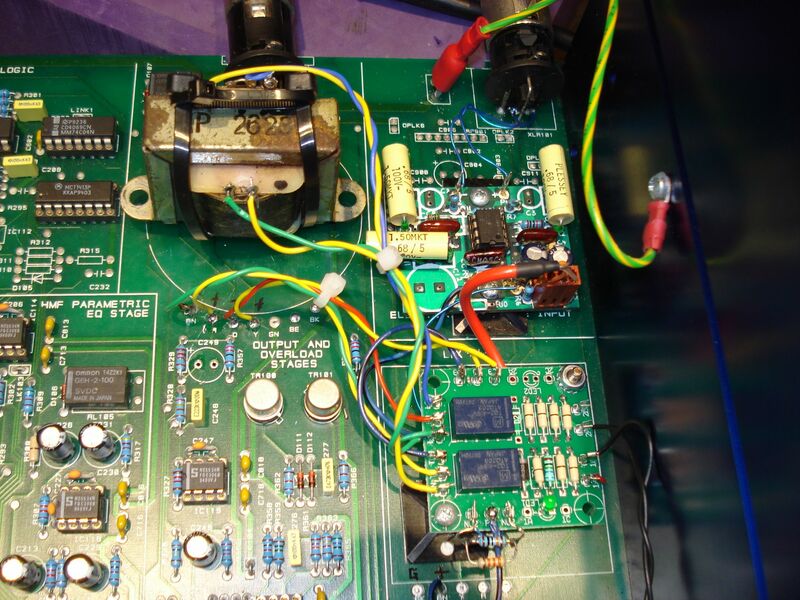 The overdesigned balanced input stage is replaced with a simple one opamp input stage to which is fitted an OPA627 opamp. The OPA627 opamp has exceptional specs, one of which being high common mode rejection (unwanted interference rejection, like hum and buzz). The input transformer is removed and replaced with the single opamp balanced input circuit (see #2 above). The output transformer can be replaced or optionally a relay is added to allow bypassing. (A second relay, switching in tandem with the first, adjusts output circuit gain so there is no change in level if transformer is engaged or not). The switch for the transformer bypass is facilitated by changing the fine gain pot to a pot + push/pull switch. Repeated interations of this mod have shown that there is some real benefit to replacing the NE5534 with OPA627. How many to replace is a matter of taste and budget, as the OPA627 typically costs around $20.00 each and there are a lot of opamps in the Focusrite 315. A pramatic approach suggests replacing only 3 opamps with an OPA627 and using same in the simplified balanced input circuit. The result is clairity with improved low end response or “punch”. 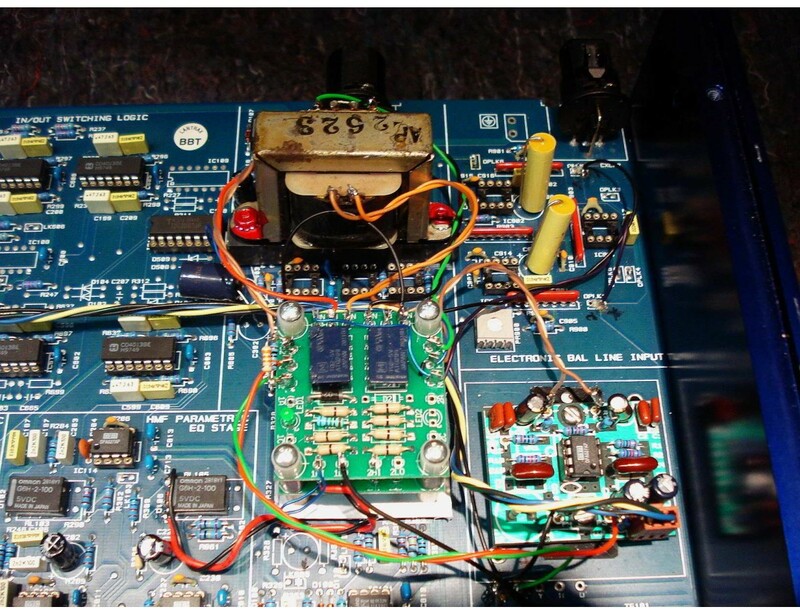 *some have opined that improvements in integrated circuit manufacturing have led to improved performance of the NE5534 over the years so that the offset voltage is actually much lower than claimed by the old and still used datasheet.